Public Citizen, a US-based non-profit consumer advocacy organisation, has called for an independent review of the raw data from clinical trials funded by Tamiflu’s maker, Roche Holding AG. "Tamiflu is being erroneously peddled as a panacea to flu," said Dr Sidney Wolfe, director of Public Citizen's Health Research Group. "In fact, no research exists to support this (claim) in healthy adults. At best, it can modestly reduce some minor flu systems in such people for a day." Public Citizen claimed that the drug does not prevent serious complications from the flu and advised that it should not be used for routine control of the flu in healthy adults. Switzerland-based Roche, the world's largest maker of cancer drugs, had claimed that its Tamiflu dramatically reduced hospitalisations as well as bronchitis and pneumonia. However, a recent investigation by the British Medical Journal and British TV Channel 4 concluded that such claims are unfounded. In the wake of widespread media coverage of the H1N1, or swine flu virus, Tamiflu sales have skyrocketed. In October, 2.5 million prescriptions were filled in the US compared with just 35,000 prescriptions in October 2008. For the past 12 months, 6.8 million prescriptions were written, compared with 4.3 million in the previous 12 months, said consumeraffairs.com in a report. In India too, Tamiflu was moderately effective for the treatment of H1N1 influenza or swine flu. “The tablets were not as effective as the company claimed it to be, but were moderately effective. The drug had side effects like diarrhoea, skin reactions and vomiting,” said Dr Mahesh Shetty, a physician based in Navi Mumbai. According to Indian government data, from September onwards, when it permitted the retail sale of the H1N1 drug, Roche’s Tamiflu has sold 4,47,340 tablets while all generic drugs that include Hetero’s Fluvir, Natco’s Natflu and Cipla’s Anti-flu have sold around 44,725 tablets combined in the 50-odd shops in the national capital region. Tamiflu is effective only if it is taken within 48 hours of getting infected. Once the lungs are damaged, the chances of survival are less. According to health officials, India’s swine flu toll has reached 880 so far. “Not all cases of H1N1 were serious. There was so much noise about nothing in the media. In India, many people die everyday from a disease like diarrhoea rather than swine flu,” added Dr Shetty. 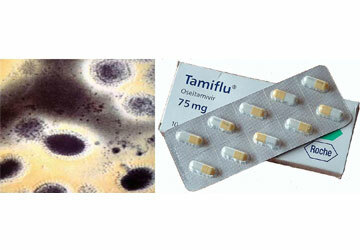 Tamiflu is mainly advised for the prevention of H1N1 virus and not as a treatment. People who showed symptoms of even fever were prescribed Tamiflu (oseltamivir), which means that patients who were not suffering from H1N1 ended up taking the drug, which caused side-effects. According to the World Health Organisation (WHO), over 11,500 people have died due to the H1N1 virus worldwide.